When busy weeknights roll around, some of my favorite 30 minute meals are stir fries. This teriyaki beef stir fry is loaded with flavor and the goodness of healthy vegetables and is on the table in less than 30 minutes. 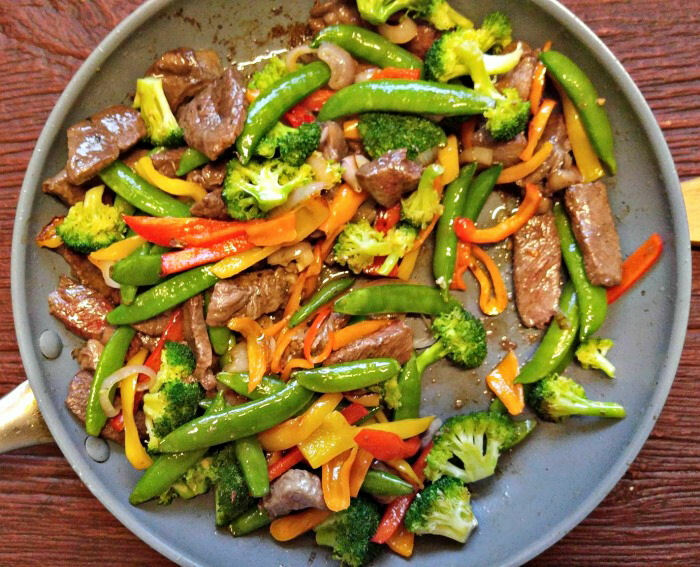 This delicious recipe for teriyaki beef stir fry has tender slices of beef, sauteed with colorful mixed vegetables, all coated in a quick and easy home made teriyaki sauce that is both Paleo and gluten free. 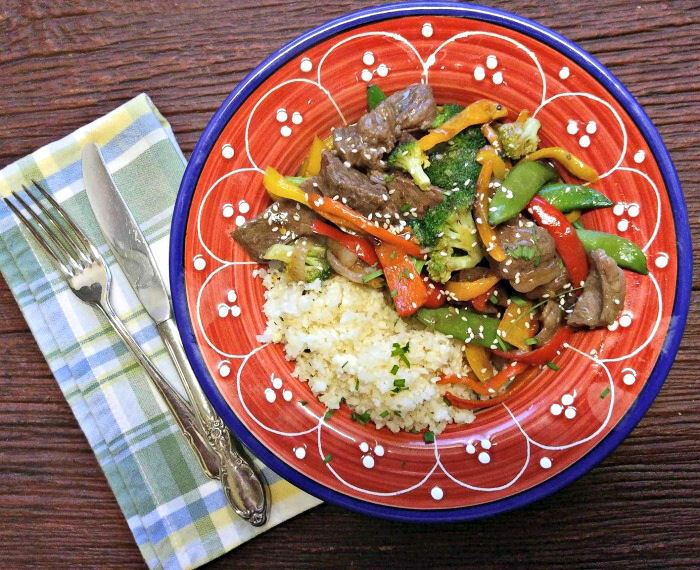 Making this teriyaki beef stir fry is super easy to do. I love a teriyaki flavor for both main dishes and side dishes. (These teriyaki sauteed mushrooms are TO DIE FOR!) I use this flavoring all the time, but it contains soy sauce and I have been trying to cut soy out lately. (Go Paleo!) My substitute for this meal is to use Coconut aminos. I discovered this product recently and use it all the time now. 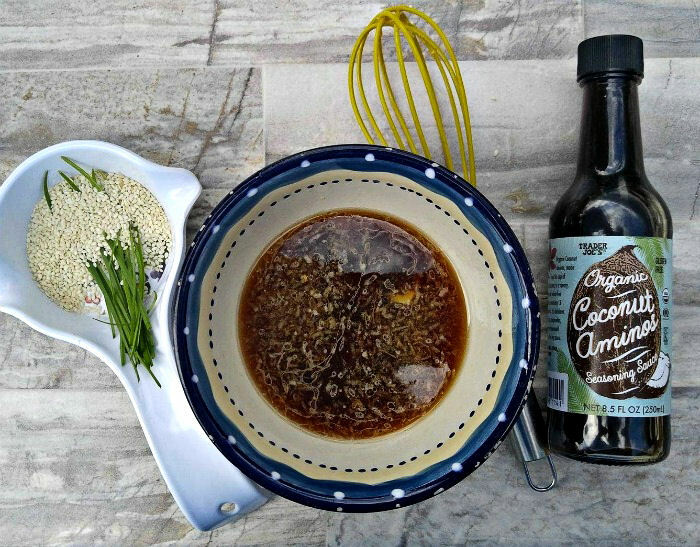 Coconut aminos is a great alternative to soy sauce and has lots of health benefits. Look at the veggies that will go into this teriyaki beef stir fry! So colorful and healthy looking! I used broccoli, sweet baby peppers, sugar snap peas and shallots. The fresh ginger and garlic will go into my sauce. A lot of the time spent on a stir fry is the preparation. 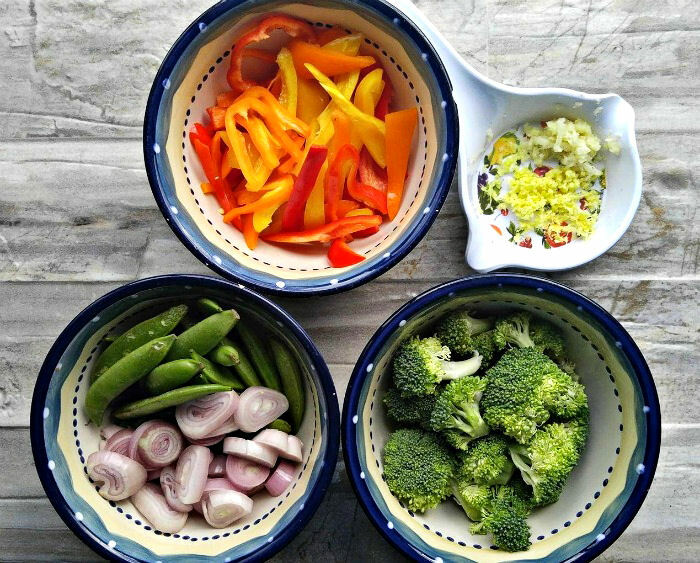 I like to chop all my vegetables ahead of time and place them into small bowls. This can even be done in the morning leaving you just 15 minutes of meal time prep at dinner time. How cool is that? 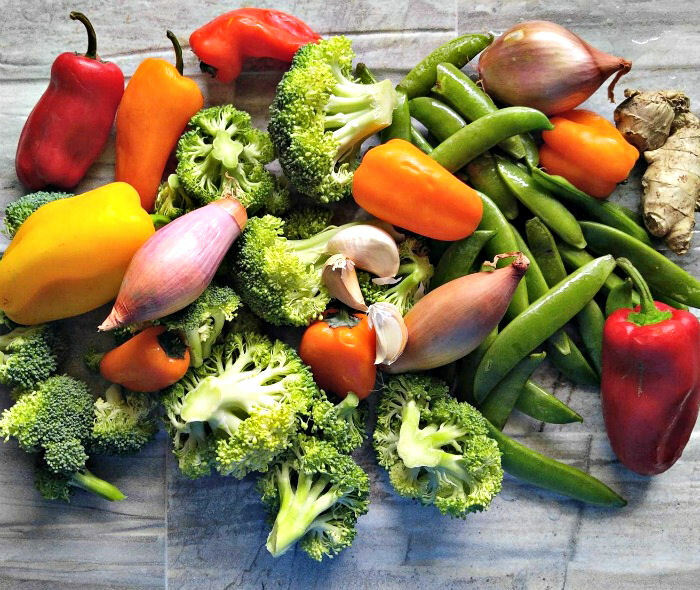 When you are ready to cook, just heat half your coconut oil and stir fry the veggies until tender. Remove and keep them warm. Add the sliced beef in the rest of the oil and cook until it is nicely browned. Back in go the cooked veggies and another few minutes to heat everything well. The sauce gets added at the end of the cooking time and everything cooks until the sauce thickens and is silky and smooth. Look at the color! I used cauliflower rice as a base instead of normal rice. My husband loves it and we rarely make rice any more. 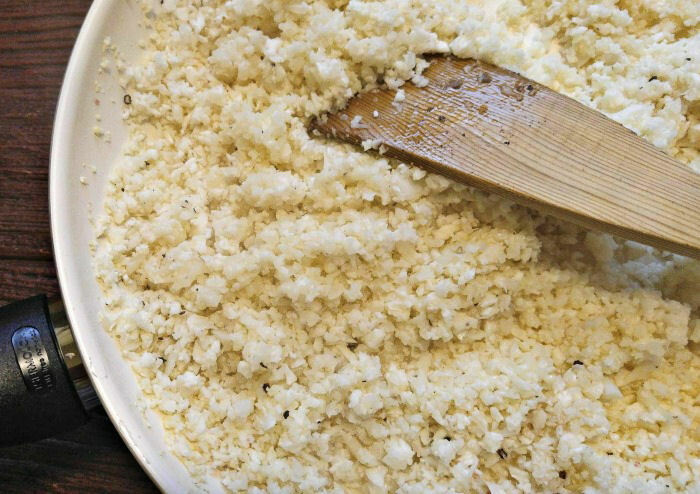 Using pulsed, cooked cauliflower saves a ton of calories and adds some more heart healthy veggies. Garnish with some sesame seeds and chopped chives. Enjoy! 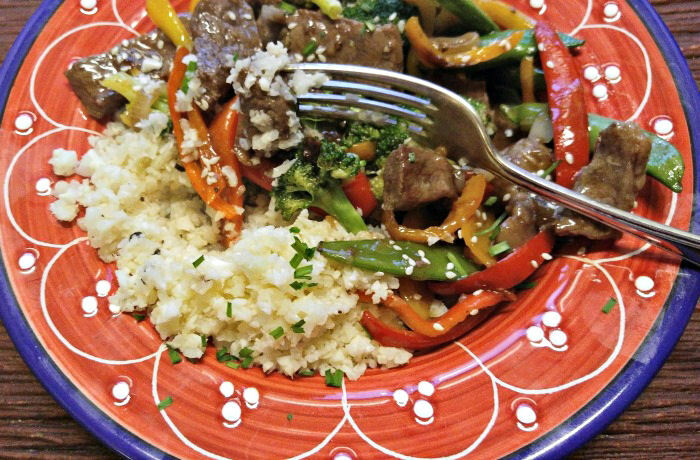 Every bite of this delicious teriyaki beef stir fry will remind you of your favorite Chinese restaurant, but you will know that it is much healthier and has no added MSG. There is no need for Chinese takeaway when you can have your own meal on the table in less than 30 minutes! Place the coconut aminos, water, stevia leaf extract, garlic, ginger, sesame oil in a small bowl. Stir until combined. Mix the cornstarch with 2 tbsp of cold water until dissolved. Add the cornstarch mixture to the sauce. Set sauce aside. Heat 1 tbsp coconut oil in a large pan over medium-high heat. Add the vegetables and season with sea salt and cracked black pepper to taste. Cook for 3-5 minutes or until vegetables have started to brown and soften. 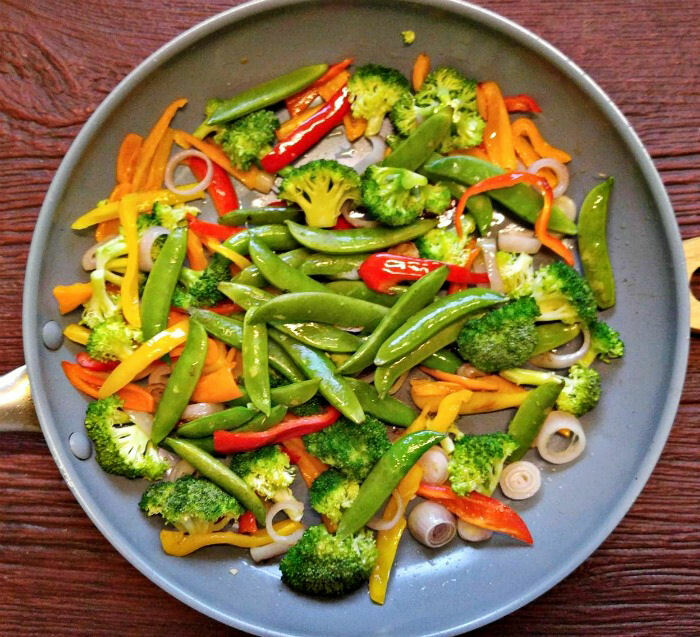 When your vegetables are crisp tender remove them from the pan and set aside. Wipe out the pan. Heat the remaining 1 tbsp of coconut oil in the pan over medium high heat. 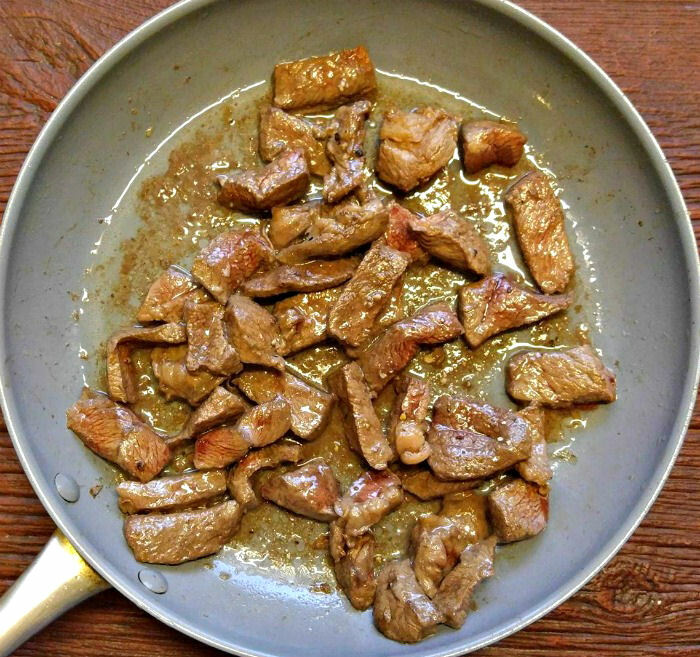 Place the steak in the pan and season generously with salt and pepper. Cook for 4-5 minutes on each side or until just cooked through. Add the vegetables back to the pan. Pour the sauce over the top and cook for 2-3 minutes over medium high heat until the sauce has thickened. Garnish with sesame seeds and sliced chives and serve with cauliflower rice.